Methylene Blue helps prevent fungal infections on fish, fertile eggs, and fry. It is also well known for its oxygen transporting properties allowing it to help increase survival rates of newly arrived fish with known cyanide and nitrite poisoning. Treats superficial fungal infections on fish and fry. Treats fungal infections on fertile eggs. Safe for freshwater and saltwater. 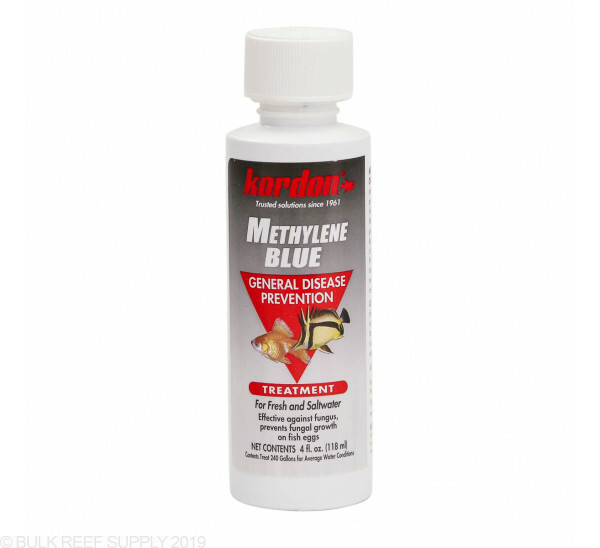 Kordon Methylene Blue can be used for general disease prevention and also with known issues like fungal infections, some external protozoans (Ichthyophthiriasis, Chilodonella, and Costia), and cyanide or nitrite poisoning. Remove carbon from the filter and continue to operate with mechanical filter media. Add 1 teaspoon of 2.303% Methylene Blue per 10 gallons of water. This produces a concentration of 3 ppm. For increased concentrations, add approximately 1/3 teaspoon (1.64 ml) per 10 gallons for each required 1 ppm increase. Only one application is needed. Treatment should continue for 3 days past free swimming stage or for livebearers 2 days after birth. Remove carbon filter and continue to operate with mechanical filter media throughout the treatment period. Add 1 teaspoon of 2.303% Methylene Blue per 10 gallons of water. This produces a concentration of 3 ppm. Continue the treatment for 3 to 5 days. Make a water change as noted and replace the filter carbon at the conclusion of the treatment. Prepare a nonmetallic container of sufficient size to contain the fish to be treated by adding water similar to the original aquarium. Add 5 teaspoons (24.65 ml) per 3 gallons of water. This will produce a concentration of 50 ppm. It is not recommended that the concentration is increased beyond 50 ppm. Place fishes to be treated in this solution for no longer than 10 seconds. Return fish to the original aquarium. Contains: Zinc free, chloride salt of Methylene Blue. Compatibility with other medications: NovAqua, Acriflavine, Chelated Copper, and Fish Protector. Cautions: Methylene Blue should not be used in systems that utilize biological filtration. It will interfere with the biological processes of nitrifying bacteria. 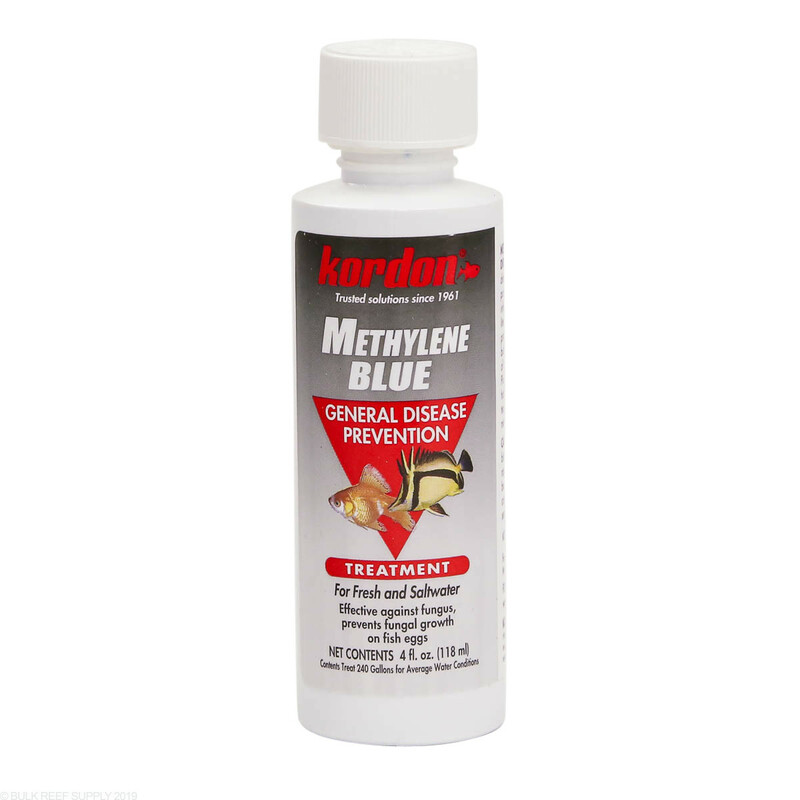 Toxicity: Methylene Blue has a wide safety margin and is nontoxic when used as recommended. Fishes tolerate relatively high dosages without side effects.